Provided details of New Tycoon Plus’ management are sketchy. 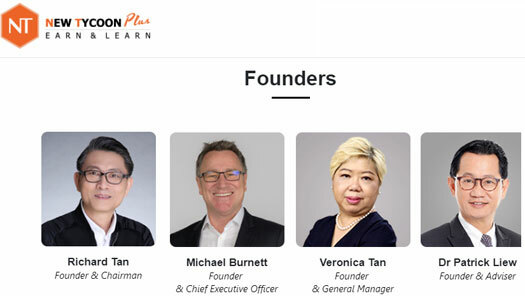 Founders cited on the New Tycoon Plus website include Richard Tan (Chairman), Michael Burnett (CEO), Veronica Tan (General Manager) and Patrick Liew (Adviser). The same names appear as founders on the Success Life website. Success Life claim to be based out of Singapore and are gearing up to launch a pointless “Success Tokens” ICO next month. a fully owned Subsidiary of Success Resources Global Media as Listed on ASX. Why a Singapore company is listed on the Australian Securities Exchange is unclear. The actual company name appears to be “Success Global Media”, who are indeed listed on ASX. There is of course nothing about New Tycoon Plus as part of Success Global Media’s ASX listing. On their website, Success Global Media claim to be ‘one of the leading global providers of educational resources‘. Success Global Media provide a corporate address in Singapore on their website, suggesting the company has no actual physical presence in Australia. Things get even more murky when you consider New Tycoon Plus refers to itself as a “Hong Kong limited company” in its Terms and Conditions. A visit to this domain reveals a marketing page for Success Resources “live seminars and workshops”. There’s an MLM business opportunity attached to selling these seminars and workshops to a recruited downline. The Alexa traffic ranking for the New Tycoon website suggests it’s a failed venture. As far as I can tell Richard Tan is an actual person, although no information about him is provided on the New Tycoon Plus website, ditto the SuccessLife website. According to promotional material, Tan has recently been speaking at free “Cryptocurrency investor summit” events held around the world. New Tycoon Plus appears to be Tan’s second MLM venture behind the failed New Tycoon attempt. Read on for a full review of the New Tycoon Plus MLM opportunity. New Tycoon Plus has no retailable products or services, with affiliates only able to market New Tycoon Plus affiliate membership itself. Upon investment maturity, New Tycoon Plus affiliates are also given 5% of their initial investment amount in Success Tokens. New Tycoon Plus pay referral commissions via a unilevel compensation structure. New Tycoon Plus affiliate membership is $50 plus a minimum $1200 investment in bitcoin. If we look at the Alexa traffic history of the SuccessLife website, we learn business is pretty quiet. And Russia of all places is the top source of traffic to the domain. The traffic history of Success Resources similarly reveals business was quiet until September last year. This is presumably why the recent Cryptocurrency investor summit are free to attend. Tacked onto the existing businesses is New Tycoon Plus. Supposedly New Tycoon Plus generate guaranteed ROI revenue through cryptocurrency mining. The company however fails to provide any evidence of cryptocurrency mining taking place. The only thing linking New Tycoon Plus to cryptocurrency mining appears to be stock images of GPU and ASIC miners used in their marketing material. Even if New Tycoon Plus is given the benefit of the doubt regarding their mining operations, the business model still makes no sense. Cryptocurrency mining does not equate to a fixed monthly return. 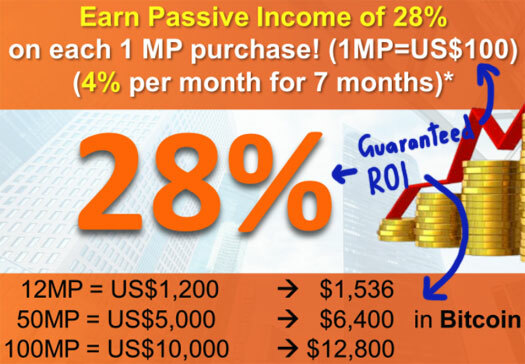 So how is New Tycoon Plus guaranteeing investors a 4% ROI every month? We know next to nobody is buying “live seminar” tickets, so that leaves new investment as New Tycoon Plus’ sole verifiable source of revenue. 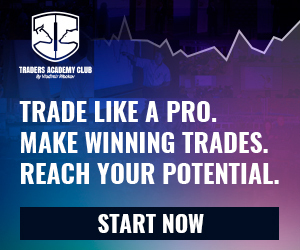 Using newly invested funds to pay existing affiliates a 4% ROI would make New Tycoon Plus a Ponzi scheme. Further supporting this is New Tycoon Plus’ “no refunds” refund policy. strictly no refunds or cancellations after payment has been made. Because y’know, nothing screams legitimacy more than “once you hand over your money it’s gone”. The argument could be made that invested funds are used to purchase mining hardware, however as per their own marketing material New Tycoon Plus don’t start paying out until one month after the initial investment date. That’s plenty of time to issue a refund… unless they’re using that money to pay out existing investors. At the time of publication Alexa estimate the US is the largest source of traffic to the New Tycoon Plus website (18%). …which is a problem because neither New Tycoon Plus, SuccessLife, Success Global Media or Richard Tan are registered with the SEC. Success Resource Global LTD is registered with the SEC, however they haven’t made any filings since an unrelated FORM D back in 2013. Nothing about their SuccessLife ICO or New Tycoon Plus has been disclosed. Recently US regulators went after Power Mining Pool, an MLM company that also promised investors cryptocurrency mining ROIs. Like New Tycoon Plus, Power Mining Pool was not registered to offer securities in the US. Upon being caught out, Power Mining Pool’s admins shut down their website within 24 hours and did a runner. How much investors lost in Power Mining Pool is unclear, however the company’s social media accounts are full of affiliates lamenting their losses. Food for thought, considering word on the street is New Tycoon Plus is being touted as a reload scam for Power Mining Pool victims.